This blog is (mostly) about the practical ways of making sustainable buildings happen. How do we communicate and work together? What tools do we use? How do we get buildings certified? A funny thing happens every year: I go to Greenbuild*, get all pumped up, wish to share my enthusiasm and all the good news with the world, then BAM! the holiday season is upon us. Yes, it's been a few weeks since Greenbuild 2012, but that's no reason not to share. I started my week off participating in the first "LBC Materials Research Agenda" forum on Tuesday hosted by Oregon Best, which was not officially part of Greenbuild but a "pre-event". We tackled what has been identified as the most common "problem" building materials that need new solutions, such as waterproofing, insulation, plastics, and composite woods. We split into teams to define the problems and to challenge manufacturers, scientists, and researchers to solve the issues to create better materials. The report will be published soon. On Wednesday at the Opening Plenary, we were fired up by Rick Fedrizzi, President of +USGBC (U.S. Green Building Council), who is clearly ready to take on the climate change deniers. Our new mantra is We Are Right! You can see the teaser video here: https://vimeo.com/53628669, full length is coming. Also on Wednesday, I had the opportunity to see Van Jones speak. I almost wanted to tweet everything he said. I suggest watching the video at https://vimeo.com/53686515 since I can't possibly do him justice. Actually, you can watch all the Master Speakers for free. Go to http://greenbuildexpo.org/live.aspx for the full list. Using the sidebar on the left, you can view speakers from past years as well. They are all well worth a lunch break. As some of you may know, LEED is coming out with a new version next year. In addition to all the v4 changes, the online tools are also being overhauled. You can now browse all the credits for all the systems and get resources for each in one simple interface in the LEED Credit Library. Using the drop-downs you can choose a system and a version. From that one page you can see the current credit language, rulings, resources, and a view of the LEEDuser forum for that credit. This is so much easier than the old system, especially as it can help us all keep up to date without looking in several places. I could keep going but I think that's enough for one post. More in the new year. *'Greenbuild®' and related logo is a registered trademark owned by the U.S. Green Building Council® and is used by permission. For those of you going to Greenbuild this week, you may be interested in a few of the interesting spaces and arts nearby if you find you have a moment free. I know time can be hard to come by during this week, but sometimes a breather is good. Grab a colleague and go check these out. On the North side of Yerba Buena Gardens is the Daniel Libeskind designed Contemporary Jewish Museum (www.thecjm.org) Go poke your head into the front door. You can meander through the lobby and gift shop without paying admission, though you do have to go through a quick security check. The juxtaposition of his design with the old facade is pretty remarkable. Closed on Wednesdays. Next door to the Jewish museum, across the street from the NW corner of the park, is the Museum of Craft and Folk Art (www.mocfa.org). Right now they are showing an exhibit of Japanese fiber art. In the back corner of this exhibit is an architectural project by Dai Fujiwara which uses fabric and sunlight to change the feel of the interior space. This is your last chance to enjoy the small museum, which will unfortunately close permanently on December 1st. Closed Sundays through Tuesdays. A few minutes away from the convention is Union Square, which some of you may be staying near. There is a tiny pedestrian street called Maiden Lane on the east side of the park, off Stockton, in which sits a Frank Lloyd Wright building, the Xanadu Gallery. Originally a gift shop, it was designed in 1948 and features a Romanesque arch, spiral ramp, and bubble-like ceiling. Definitely worth a look. Be sure to go to Mario Botta designed SFMOMA (www.sfmoma.org) on the East side of the park. There are many wonderful exhibits here, but if you are short on time I recommend two currently on display. On the second floor is an exhibit called "Field Conditions" which features conceptual architectural drawings by Libeskind, Stan Allen, Marsha Cottrell and Thomas Faulders. It's great to see these works up close and full size instead of reprints in a book or magazine. On the top floor is "Six Lines of Flight" which includes some city maps by Tiffany Chung. The subject matter is places and locations of disaster, but the renderings are exquisitely beautiful. Closed on Wednesdays. Hope you get to enjoy some of this! See you at the convention. One of the things I love about what I do is the intersection of science and nature. During my thesis I studied math and how it results in beautiful shapes in nature, which has been picked up by many cultures, in order to inform how today's buildings can use that as a jumping off point to have less environmental impace. Sure, I'd heard about it before, but it is really amazing when you look in depth. Mother Nature Network used the recent hurricane to bring it to our attention. 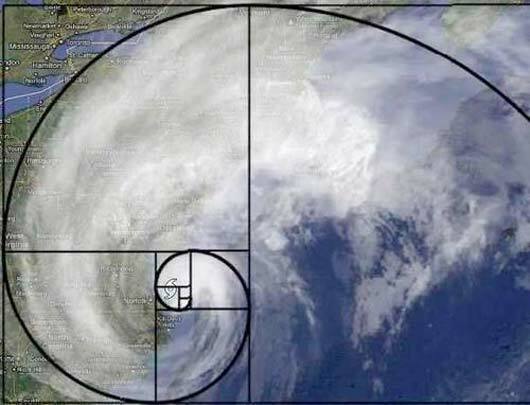 In their post on Tuesday: Finding the Fibonacci Sequence in Hurricane Sandy, Shea Gunther beautifully explains and illustrates a favorite number sequence of designers. Enjoy. All work copyright Carolyn Day unless otherwise attributed. Awesome Inc. theme. Powered by Blogger.